The Episode starts with Doctor coming to Harak Singh’s house. Harman says you are here? Preeto says she came to give vaccination to baby. Soumya says he is small. Preeto asks her to give baby to Harak Singh. Soumya gives baby to him. Harak Singh calls him shera. Doctor gives the vaccination. Soumya smiles. She hugs the baby and says she will be with him all life and will spoil her night to lighten his morning. She gives bath to baby and makes him wear clothes. Shakti song plays…….Soumya asks baby not to let her far from him and says you are my Prince and will always be. Varun brings Pandit ji to Sukha and says he is our family pandit. Sukha asks him to do his work and asks him to tell Harak Singh to go to temple along with his family and break coconut. Pandit refuses to tell. Sukha asks him to do the work else wait for his shradh arrangement. Baby starts crying in the night. Soumya checks and tells that he is having much fever. Harman says Doctor told that he will get some fever. She runs out of room and informs Harak Singh and Preeto. Preeto says it is normal after vaccination. Harak Singh runs to room worriedly. Raavi brings oil and asks Soumya to apply on baby’s feet. Harak Singh recalls preeto’s idea to lessen the fever and wraps baby’s feet with the cloth. Preeto says his fever will get down like yours. Shanno says he is not our blood and asks them to call Doctor. Harak Singh gets up and goes upset. Preeto comes to Shanno and slaps her hard. She says I am the owner of the house still and asks her not to open her mouth and stand here and see that their relationship is strong than blood relations. Veeran comes to Harak Singh and says they are making you weak by using your emotions and wants you to have emotional connection with him. He provokes him against Soham and Soumya. Preeto checks the fever and says it is low now, and tells that love relation is stronger than blood relations. She asks Soumya to give baby to Harak Singh. Harman says even I want to see how Dada get happy taking his grand son in his arms . Soumya comes to harak Singh and tells that fever is gone. Harak Singh says you can’t make me senti using the baby. Harman says what happened to him suddenly. Preeto asks him to let Harak Singh vent out his anger. Veeran and Shanno smiles. Harak Singh says you are a kinnar and can’t become my bahu. She says if you are thinking that I will accept you as bahu then I will not do till my last breath. 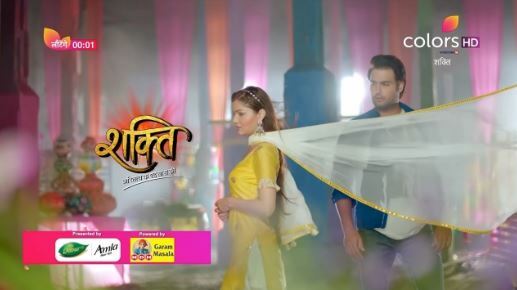 Preeto tells Harman that harak singh is upset with Soumya. Harak Singh says you are inauspicious for my son and this house. Soumya is about to go. Harak Singh asks her to give the baby and leave from there, and says you are a kinnar. Varun calls Soumya and asks her to go and save her family, as they are going to blast the bomb and not cracker. Sukha tells harak Singh the same. Harak Singh runs to save his family. Soumya runs with baby Soham towards the temple.